-La Dolce Vita (an Etsy shop) Natural Soy Melts in Lavender Vanilla (2 cubes) in my 25W lightbulb warmer in the bedroom. 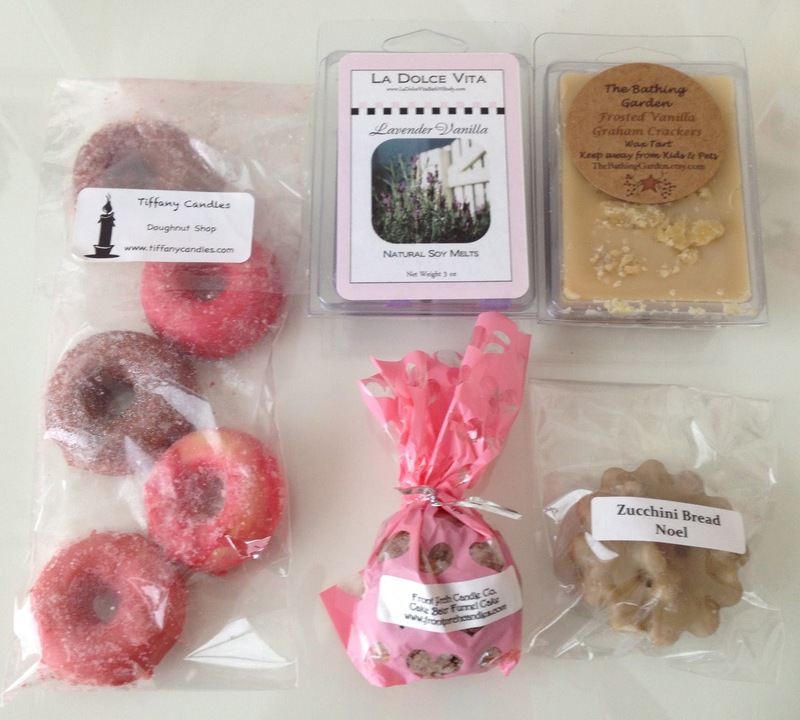 La Dolce Vita really makes great tarts with good scent throw and nice lasting power. I have 5 clamshells from her and they are all great. This is a lavender vanilla similar to the Yankee version. -Ye Olde Candle Cubbard Zucchini Bread Noel in my 20W hot plate melter in the first floor. This smelled really good though the vanilla note didn´t really come through so it smelled pretty much like a creamy zucchini bread. Staying power was good and scent throw about medium I´d say. -Front Porch Cake Batter Funnel Cake in a tealight warmer in my kitchen. I didn´t like this scent at all. It was a weird sorta greasy chocolate smell. It wasn´t strong though and I didn´t relight the tealight once it was out. -The Bathing Garden Frosted Vanilla Graham Crackers in a 25W lightbulb warmer in my living room (my living-dining area is really huge so I put this warmer in the other corner). A strong cinnamon bakery scent with excellent scent throw and tremendous staying power. It was too much for me though paired with Tiffany´s Doughnut Shop.